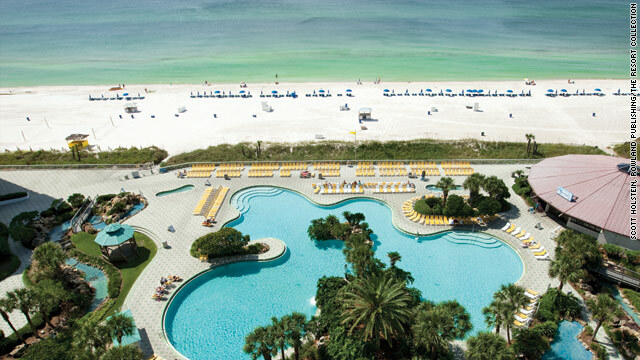 This file photo shows the view from the Edgewater Resort in Panama City Beach, Florida. The state's beaches are oil-free. One resort's slogan: "The only oil on our beach is suntan oil!" (CNN) -- The water is clear, the sand is sugar-white and the beaches are as inviting as ever along most of the Gulf Coast, but images from the massive BP oil spill have prompted many tourists to bolt to other destinations this Memorial Day weekend. Some are taking a closer look at places such as Hilton Head Island or Myrtle Beach in South Carolina. That's set off an intense effort by tourism officials and businesses in the Gulf of Mexico to lure them back. Hotels in Florida, Alabama and Mississippi are using everything from "beach cams" and money-back guarantees to constant updates on their Web sites to get the word out that their beaches are clean and open for business. Even President Obama has chimed in. "Americans can help by continuing to visit the communities and beaches of the Gulf Coast," he said during a news conference Thursday. "I was talking to the governors just a couple of days ago, and they want me to remind everybody that except for three beaches in Louisiana, all of the Gulf's beaches are open, they are safe and they are clean." Still, the outlook for this holiday weekend and beyond is bleak in some areas. Hotel bookings in the Florida Panhandle are down about 30 percent -- and in some cases 50 percent -- compared with this time last year, said Carol Dover, president and CEO of the Florida Restaurant and Lodging Association. Some hotels that have traditionally sold out on Memorial Day weekend are reporting dozens of rooms still empty for the holiday, she added. "We are just devastated to be rolling into Memorial Day," under these circumstances, Dover said. "It's horrible." "There's not a drop of oil anywhere on our beaches, the sand is white, the charter fishing boats are going out, the sun is shining and it's absolutely beautiful ... [but] the perception is that we have oil on our beaches," Dover said. Memorial Day to Labor Day is the peak season for northern Florida, which gets cold in the winter and doesn't attract visitors during those months the way the southern part of the state does. In an effort to reassure visitors, many hotels are changing their cancellation policies or offering to refund room rates if guests see any oil on the beach -- a scenario they feel just won't happen, Dover said. They include the six properties operated by The Resort Collection of Panama City Beach, which, like countless hotels in Florida, have been getting calls from customers asking if the resorts have any oil on their beaches or if they're expecting oil to come ashore in the coming days. The answer is always no. "They're fearful that their sacred family vacation will be ruined," said Paul Wohlford, vice president of sales and marketing for the company. "We want to make sure it's a great one... [so] we have an oil-free beach guarantee that if any oil does come on our beach, we will gladly refund their money." The company's Facebook page also features an ad with the slogan "The only oil on our beach is suntan oil!" Panama City Beach itself is offering the "Real Fun Guarantee," which promises visitors a travel credit if oil disrupts their vacation. There have been about 25 percent more cancellations than The Resort Collection would normally see at this time of year because of the oil spill, Wohlford said, but he still expects to have a pretty good summer. "We just think bookings will be more last minute than ever," he added. Hotels offering oil-free beach guarantees have also slowed down the rate of cancellations in places such as Gulf Shores, Alabama, said Mike Foster, a spokesman for the Alabama Gulf Coast Convention & Visitors Bureau. The community's website, Gulfshores.com, offers daily video updates from the beach to reassure visitors. In Louisiana, where globs of thick, heavy oil began washing into some of its marshlands this week, the tourism outlook is mixed. The state's coast, unlike some of its neighbors, is not a beach coast, and visitors come to sport fish rather than sunbathe or swim, said James Hutchinson, Louisiana's assistant secretary of tourism. Hotels catering to sport fishermen are seeing a falloff in bookings, but that's been offset by the masses of recovery workers, BP employees and journalists who have poured into the area. "So many people are down here right now who are working on the oil spill that some of the hotels are doing better than they would be doing if it weren't for the oil spill," Hutchinson said. One area that's hurting is Grand Isle, Louisiana, a barrier island whose small population swells during the summer with thousands of tourists. But that's not going to happen this year, said Josie Cheramie, Grand Isle's tourism commissioner. "It's really bad, it's very bleak. There's no tourism to talk about here because of the oil spill, there's no recreational fishing," Cheramie said. Meanwhile, hotels in South Carolina have been getting calls from people who had reserved rooms in places along the Gulf Coast but have been looking to relocate because of the spill, said Tom Sponseller, president of South Carolina Hospitality Association. Some have expressed interest in Hilton Head Island, and the resort community is sold out for the Memorial Day weekend, said Charlie Clark, vice president of communications for the Hilton Head Island-Bluffton Chamber of Commerce. But Hilton Head is always traditionally full for the holiday, so there's no way of quantifying how much of an effect the oil spill has had on its tourism, she added. Earlier this month, an editorial in Alabama's Mobile Press-Register called South Carolina tourism officials "buzzards" for running ads in the Birmingham market touting Hilton Head Island as a destination. But Clark said it was not a new project prompted by the oil spill, but rather a continuation of a regular campaign. "Obviously, we could be in the same situation so we're not actively, as far as I know, out recruiting those people to change their plans," Sponseller said.